There are so many great next-generation Wi-Fi systems out there that will give your home network a serious boost. Of course, not everyone needs a $400 system to enjoy good wireless performance. You might have great service around most of your house or apartment, but there’s just that one little area in the basement or upstairs bedroom that doesn’t get solid coverage. 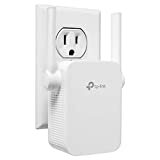 Instead of spending hundreds on a new Wi-Fi system, first try spending $19.99 on a top-rated TP-Link N300 WiFi Range Extender, which is currently discounted on Amazon.